Though they clearly do not encourage the consumption of meat as regular food, the ancient Ayurvedic texts explain the nature and effects of various types of meats in a very peculiar manner for those who do. First of all the animals are classified in a very interesting manner. When you look at the list, you can find birds like crows, sparrows or owls in the same category of animals like cows, camels or bears. One would wonder why ? What kind of a classification is this ? 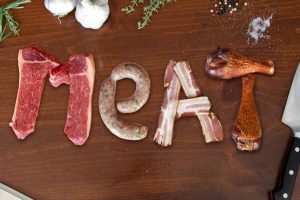 In Ayurveda, the different meats are not classified according to the morphology of the living entity or their nutritional value. The different types of meats are classified according to the behaviours of the animals, birds etc their eating methods, activity patterns, sleep patterns, habitat and such other characteristics. Why ? This is because our ācāryas were concerned more about knowing the effects the different meats would have on the human body. For example, all the meats are usually hot in potency (virya) but there are some exceptions which are cooling in potency and these are all grouped under a separate category. The meat of carnivorous animals are characteristic in the fact that they produce a pungent (katu) effect after digestion (vipaka). The male and female of the same species also have different effects on the human body when consumed. Who would imagine that ? The different parts of the body of the meat of the same animal have different effects on the human body when consumed. There are also differences in the effects between two legged and four legged animals. 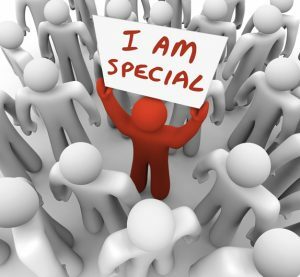 Though the descriptions of the foods are in the early part of the literature, one will really be able to appreciate the descriptions only after having studied the physiology and pathological variants that occur in the human body. For example when it is said that the meat of carnivorous animals is good for chronic hemorrhoids (jīrṇa-arśas), one will need to know that the pathology of chronic hemorrhoids is due to a vata kapha disorder resulting from irregularities in agni and apana vata. The behavior of the animal influences the effects that its meat produces. For example if an animal sleeps too much, eating the meat of that animal will result in increased kapha in the gross body as well as tama guna in the subtle body. If an animal eats a lot of different types of leaves and actively jumps around all the time, its meat will be light and easy to digest. The effects of different meats on the various bodily functions are also described. This means that the acharyas of the past had devised various methods to understand that. Of course there can always be some exceptions which are categorized separately. Here again the functional nature of the Ayurvedic science becomes apparent as opposed to the structural nature of modern nutritional science. To classify a food based on its carbohydrate, protein, fat, vitamin and mineral content is a structural evaluation. The fact that a certain meat contains more protein does not make it any healthier. To classify the meats based on whether they are heavy or light to digest, laxative or constipative, influence on the three doṣas and so on is a functional classification. The latter is preferred in Ayurveda. “Meat of animals that are freshly slaughtered, clean and young is suitable for consumption. Meat of animals died naturally, emaciated, rich in fat and those which have died of diseases, drowning or poisoning are to be avoided from being consumed.” (Reference – AH. Su. 6. 69). This means that meat that is transported or stored in refrigerators are not recommended according to Ayurveda as beneficial for the body. So much for the meat industry. It appears that the only possibility of eating meat that is healthy in any way is to kill the animal and eat it immediately. Or else it is nothing but slow poison. Thus we can conclude that the effect of the meat on the human body is more important than the taste or nutritional value. And this is how Ayurveda has classified them as beneficial or not. Of course the classification in the ancient texts does not include the case of an animal who is chained in a closed space all his/her life, injected with steriod hormones and antibiotics, cruelly exploited, beaten, tortured, stripped of his/her skin while alive and painfully slaughtered. Imagine what effect it would have on our bodily functions ! We may need to add that as a special category when we update the texts. Thank you for reading. P.S: This article is not meant to recommend or promote meat eating in any way. The author of this article is himself a strict vegetarian for the past 25 years. Ayurveda does use meat or meat products in certain life saving medicines. Recently my eyes happened to fall upon an advertisement for an online course in a specialized subject of Ayurveda for westerners. Such specializations are undertaken by students in India after completing their BAMS degree for five years and a firm grounding in the principles of Ayurveda. It set me thinking “Is this appropriate? Do most of the western students have the basic tools to enable them to study and comprehend such advanced subject matter? Is Ayurveda going in the right direction in the western world? What are the teachers who are teaching these courses aiming to achieve? Will the right ends be achieved? Is it a camouflaged way of compartmentalizing Ayurveda?” and so on. Some of the specialization courses undertaken in India are Panchakarma, Kaumarabhrtya (Pediatrics), Shalya chikitsa (Surgery), Kaya Chikitsa (General Medicine), Prasooti and Stri roga (Obstetrics and Gynecology), Manasa roga (Psychiatry), Bhaisajya Kalpana and Rasa shastra (Pharmacology) etc. Here the great sage Caraka, in the very last chapter of his book, is reminding us of the importance of receiving knowledge in the proper way and warning us of the consequences if it is not done so. 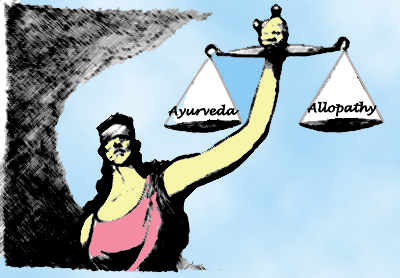 Ayurveda is a double edged sword. It is of interest to notice that Caraka has first mentioned the result of not receiving the knowledge properly rather than the result of having received it properly. Hence we have to be very careful knowing that we are dealing with a highly inflammable substance. It is not wrong to have a desire to study specialized topics in Ayurveda. At the same time, one should understand that without a strong fundamental understanding, one will only be wasting time (or even causing harm!). We all know that a building is as strong as its foundation. Will our house keep standing when the “big bad wolf” (the imbalance in a patient) comes and starts to huff and puff ? Unlike in modern medicine, when we try to specialize in a particular topic in Ayurveda, we will need to always keep going back to all the fundamentals. This is why it is often said that if one knows the first section of the ancient text (sūtra sthāna) properly, there is no need to study anything else. If we turn it around we can also say, “If one does not study the first section of the ancient text (sūtra sthāna), then there is no use of studying anything else.” Because everything else is only an adaptation of the same fundamentals into another area. 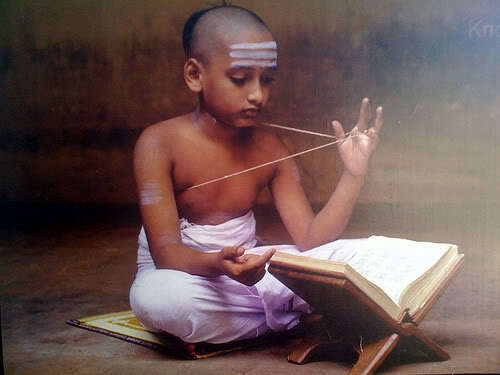 Why else would the students who were trained traditionally be taught the first verse of the Astanga Hrdayam for six months? Of course the gurus were not crazy. In modern medicine for example if one becomes a gynaecologist, it is not really necessary to remember the course of the radial artery or the biochemistry of muscle contraction, which one studied in the first year of medical school. But in Ayurveda you will need to remember each and every teaching of the sūtra sthāna in every step of advanced study. In Ayurveda when you go to an ophthalmologist for example, they are not only checking your eye. The symptom in the eye is only an indication of what is going on holistically in the body. And to connect in that manner, one should have all their basic principles thorough. This is because modern medicine is based more on structural application (How it works?) while Ayurveda is based more on functional application (Why it works?). The difference is subtle. Whenever I would ask a question to my teachers about an advanced subject matter, they would advice me to go back and read certain verses from the sūtra sthāna. I went to study from some of the senior specialized vaidyas, and they told me to come back after studying sūtra sthāna. Some students ask me “What are the Ayurvedic medicines for Scleroderma? What is the Ayurvedic treatment for Psoriasis?” Studying a specialized subject is not about memorizing a list of herbs and medicines that can supposedly be prescribed in advanced disease conditions. Such a memorization of lists is very easy. the most superficial vaidya is one who prescribes a medicine for a disease that is indicated in the verse describing that medicine. eg. Guduchyadi kashayam in vomiting. the second level vaidya is one who looks at the cause and prescribes the medicines given in the chapter describing that disease. eg. Dadimadi ghrtam for pandu. the third level vaidya is one who is capable of analyzing the avastha of the imbalance (situation) as well as the medicines/lifestyle/diet with respect to the fundamental concepts of Ayurveda and make a customized prescription. eg. 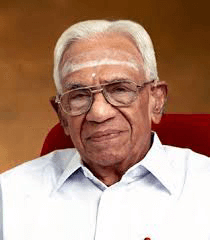 Vidaryadi kashayam for lumbar disc prolapse knowing that we have a situation which is a vata dominant, vata kapha disorder where the dry quality of vata is more aggravated than the cold quality. The third level of vaidya is what we should be aiming to become. I would logically assume that the intention to study a specialized subject is to help people who are suffering from various specialized ailments. Or is it meant to refer patients to go to India? We can test ourselves when we try to perform nidāna and cikitsa of a rogi after completion of our studies. If we are unable to successfully provide comfort, relief and cure to a rogi who comes to us, then our study has not reached its fruition. After having undergone these “specialized” courses without having a strong foundation in the basic principles, no one will be able to accurately diagnose and treat (though it may not be legal to use that term in the west) a patient. That is what we are intended to do as healers, right? And if our intellect brings up the argument that it is not within the legal scope of doing that, then why waste time and money doing such courses? Yes one may even argue that “we have to start somewhere.” But if we start in the wrong place, the more we travel, it will only take us further away from the actual goal. The most important aspect of Ayurveda education is to root ourselves in the fundamental basic concepts including Ayurvedic anatomy and physiology. Then one should move ahead to study the basic principles of diagnosis and treatment. And after that one should understand the specific patterns of disease progression in the body. Finally one can learn to apply all the above three aspects into studying a specialized area of Ayurveda. This will shape us into independently thinking vaidyas. Otherwise we can only hope to become expert technicians at best. Please note that this article is not meant to criticize or disrespect any individual. It is written only to promote the learning of Ayurveda in the proper manner as explained in the texts and in the traditional way. Thank you. It contains the special rice called shashtika sali (brown strengthening rice) and several medicinal herbs. Srotas is the unique concept in Ayurveda. As is the case with vata which is the inevitable component in every movement, so is the case with srotas which provides the pathway for every movement. These channels need not be anatomically present always; sometimes it is a physiological channel, sometimes it is a biochemical channel and so on. It shows that visualizing the srotas as a vessel or tube is an injustice done to the observational skills of our great Ayurvedic vaidyas and gurus. They have definitely recognized the unparalleled physiological and biochemical events occurring in our bodies and summarized all those events into the concept of srotas. Following this principle, a blood vessel should never be considered as rasavaha or raktavaha srotas only. Instead by understanding the physiological events occuring inside the circulatory system we can suggest that it is combination of many srotas working at the same time. All those functions of each of the srotas are going on inside the circulatory system. This is how the concepts in Ayurveda should be understood.